Would you like a OVP sample? Values are concepts or beliefs which people use to guide their behaviour in the workplace. Values will drive our decision-making and cause us to summon up energy to preserve what we believe in. They go beyond specific situations and determine how we view people, behaviour and events. Often major sources of conflict and disillusionment are due to mismatched values. The values that an organisation has are usually an expression of the personal values of the senior management, which have impacted the organisation over time. The Window on Work Values is a model built over five years from gathering individuals' responses to many questions defining work activities or situations at work that they value. The focus is on values where the primary content aspect is the type of goal or motivational concern that the value expresses. The model has good structural validity, meaning that value types close to one another in the window are related whereas those on opposite sides of the window are unrelated. The model can be applied to both individual and Organisational values. Self Focus: Value types that put personal goals ahead of group goals. Individualism is the core value type in this quadrant. Group Focus: Value types that put group wishes ahead of individual need. Collectivism is the core value type. Organisational Constraint: Value types that require strictly-adhered-to guidelines to ensure the smooth running of an organisation. Compliance is the core value type. Organisational Freedom: Value types where individual behaviour is unrestricted and people are free to choose their pathways, unfettered by Organisational constraints. Empowerment is the core value type. Values focusing on the group, within an environment of Organisational Freedom are defined by the Equality value type. Those focusing on the group within an environment of Organisational Constraint are defined by the Conformity value type. Individual values are determined from answers to the 64-item Window on Work Values Profile Questionnaire. The feedback is a hierarchy of value types and valuable information on how a person's values will impact their behaviour. Organisational values are determined from answers to the 32-item Organisational Values Profile Questionnaire. This multi-rater instrument gives feedback on the Organisational values perceived by any number of respondents. Comparisons between Organisational groups are given in terms of the value types. A comparison can also be made between an individual's view of the organisation's values and their own values. Team Management Services has a process which uses the Window on Work Values to develop a Team Charter which lists core values that the team would like as the foundation of how the team works together. Action-based ground rules then relate to these shared values. Would you like more information on the Organisational Values Profile? 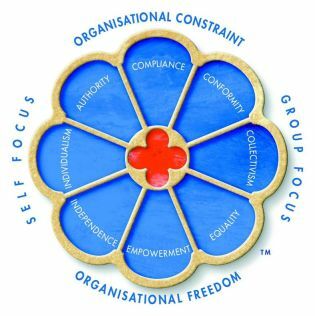 Would you like to become accredited to use the Organisational Values Profile?